Announcement ----> A beautiful interior needs a beautiful thing, too. 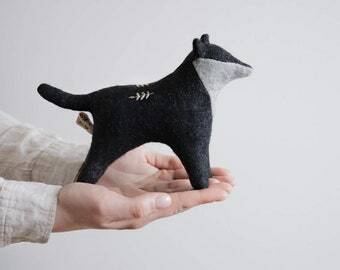 Your favourite place and our handmade toy may complement each other perfectly. Simple lines and shapes, simple colours, natural materials and handwork make our design unique. 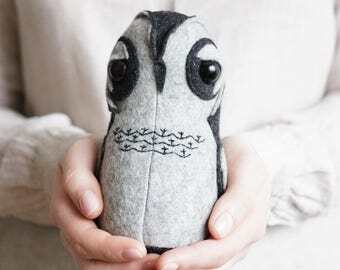 Each woodland animal is made of high quality 100% wool felt with handmade embroidery on its fur and stuffed with sawdust or polyester fiber to your choice. Apart from that, the toy is a good companion for adults and children. Use it as something that brings joy into your life. Play with Bear. Travel with Bunny. Run together with Fox. And Owl helps you fall asleep faster. ----> Send a photo with an animal you have received by review to get free printable animal masks for a party or to play, for adults and children. ----> We sell toys at wholesale price. If you want to become our retailer, just contact us. ----> A beautiful interior needs a beautiful thing, too. 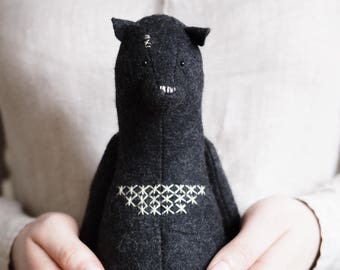 Your favourite place and our handmade toy may complement each other perfectly. Simple lines and shapes, simple colours, natural materials and handwork make our design unique. 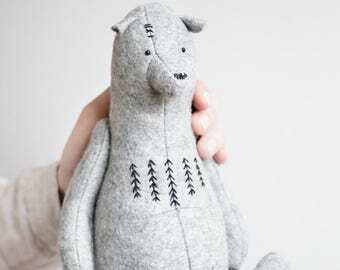 Each woodland animal is made of high quality 100% wool felt with handmade embroidery on its fur and stuffed with sawdust or polyester fiber to your choice. 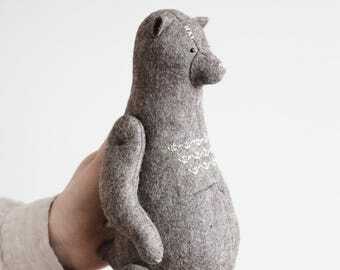 Apart from that, the toy is a good companion for adults and children. Use it as something that brings joy into your life. Play with Bear. 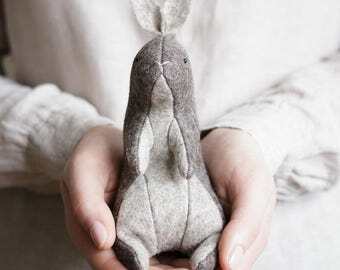 Travel with Bunny. Run together with Fox. And Owl helps you fall asleep faster. 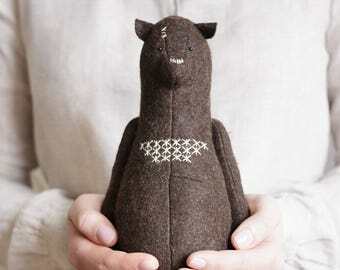 Very nice handmade quality. It’s sure to make an excellent present. Thank you! This lovingly crafted in our small workshop can be personalized with a name, a date, or saying. We are extremely happy to write that our toys visited the Venice Biennale, one of the largest and best known contemporary art expositions in Europe, as an exhibit. Surprise dad with a one of kind gift for Father's Day! Owl helps you fall asleep faster. We are artists and friends behind Forestmisha who love their job. We are from a small town Penza, Russia. 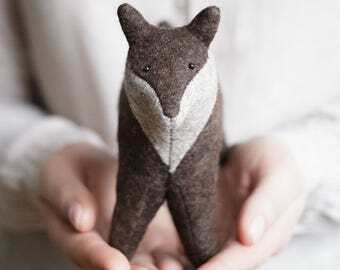 We design and sell handcrafted toys and printable masks of woodland animals such as a bear, an owl, a rabbit and a fox. This project was created with passion and sincerity for those who appreciate natural things and fall-in-love simple forms. Most of our ideas are inspired by nature. 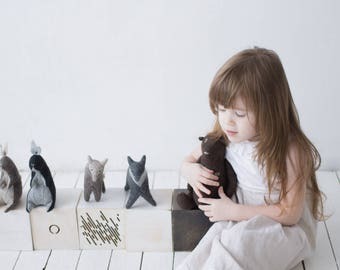 Forest, plants and flowers around us help us to create toys. Simple lines and shapes, simple colours, natural materials and handwork make our design unique. We enjoy working with wool that is safe and a very warm product of nature, and sawdust smells so pleasant. Usually we start thinking about a new toy or a collection by creating a mood board, then we work with drawings, material, its color and texture, and on technique until we are impressed by the results. Embroidery lets us get closer to art and traditional crafts. Illustration is our visual language to share love and happiness with you. Everyday work, relatives and customers' support help us make more dreams come true. Thank you and join us in social networks. Send your photos with @forestmisha toys by review or post on Instagram with the hashtag #playwithbear #travelwithbunny #runwithfox #sleepwithowl #forestmask and get free printable animal masks in PDF for a party or to play, for adults and children. We sell toys at wholesale price. If you want to become our retailer, just contact us. Please be aware it is not suitable for little children due to small parts. Do not wash or dry them. Toys are hand crafted. The picture images may vary. Toys come packed in wool bags and a craft box. A greeting card with every purchase and stickers to design an envelope help you make your gift more special. 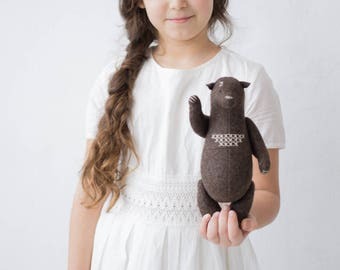 Toy can be personalized for you, if you leave a note with name to be embroidered.